Could hardly find the start yesterday morning in the thick fog after Friday nights storm up in Katoomba but eventually the bus found its way to the starting line of the 6ft track marathon. I was kind of weary heading out for this though run with 10kg on my back and my doggy knee but it was a great opportunity to try out my race gear and test last little bits and pieces. 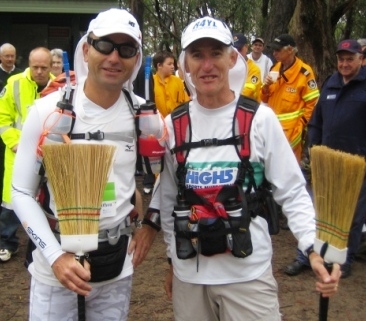 All looked fine at the start when Action Jackson handed my the broom and off we went at 8.35am at the end of a record field of runners down the steep steps towards Cox River and the Jenolan Caves….. The up and downs took a toll and especially the steep downhills together with the heavy backpack did not go down well with my knee and I started to slow down and after about 4 hours and 26km I got swiped away by my fellow sweeper as I did not want to hold them up. I continued slowly on my own (out of the race) and did all the flat bits of the race course to cover about 37 km in 5 1/2 hours. Even so my knee feels like a thousand knifes are stuck in it I was happy to at least hold up for more then 5 hours and I also found a few problems with my gear which I can now fix before heading off to Morocco. There are a few more long runs on my training plan the next 2 weeks but I guess I will have to walk them more the running – to keep my knee happy and together till 6th April.